Digital display screen is bright and easy to read with a red LED light indicating the status of power and CO.
10-year limited warranty on both the alarm and battery. 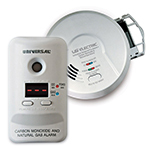 The Universal Security Instruments MCD305SB Carbon Monoxide Smart Alarm provides 10 years of continuous protection against the silent killer - carbon monoxide. Perfect for new or replacement installations, this maintenance-free alarm is suitable for houses, apartments and mobile homes. The sealed battery (included) will never have to be replaced throughout the life of the alarm, giving you a decade's worth in peace of mind even in the event of a power outage. Permanent Power also saves money from battery replacements (up to $38.00 over the 10-year life of the alarm), eliminates annoying low battery chirps and helps the environment by reducing environmental waste from disposed batteries. 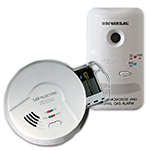 This alarm also utilizes microprocessor intelligence that assists in completely eliminating nuisance alarms, a single silence/test button to quiet a non-hazardous alarm and an end-of-service life warning that sounds when it's time to replace the battery (approximately 10-years from activation). The digital display screen is bright and easy to read with a red LED light indicating the status of power and CO.
Mount this alarm on the wall or leave it standing up on a table top. The quick activation battery pull tab makes it easy to install while the deactivation key switches the alarm off and makes the batteries safe for disposal. Once the alarm is deactivated, the tamper resistant feature turns on to prevent deactivated alarms from being reinstalled. 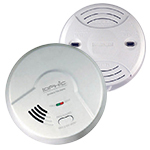 This alarm is ETL listed to UL Standard 2034, California State Fire Marshal approved and Federal Housing Authority (FHA) approved while exceeding industry standards. For maximum protection, install an alarm inside every bedroom, outside every sleeping area and on all levels. The Universal Security Instruments MCD305SB Carbon Monoxide Smart Alarm comes with a 10-year limited warranty that covers the battery and alarm. No false alarms, has a helpful digital display. Easy to test. Have used Universal Security CO monitors for years. Decided to try 10 year battery monitor instead of changing batteries every year - after using their 10 year smoke detectors for the past 2 years. Great products.. Delivered promptly. Quick and easy to setup. Best part is smart alarm with 10 year sealed battery. Small unit that is easy to install. This CO2 detector is perfect. I don't have to replace the batteries. I had some questions as to where to place the detector and phone support was very helpful. I was glad to get a product that didn't have the battery replacement issue, a ten year battery is great. I wish the smoke alarm had this kind of battery available. So far I haven't needed to use it yet. When I reinstalled the battery in the older system it seems to work. No more one beep. I am keeping them until needed. This product was easy to set up. We set them on table tops. We tested them after I pulled the tab to activate them. They are small and very loud. We are very happy with them and would buy them again!